Dan’s work as a physical therapy assistant led him to the O&P profession more than a decade ago. While attending a clinic at Southern Orthopedic Surgeons, Dan met Glenn Crumpton, who encouraged him to make a career for himself in prosthetics. Dan successfully completed the prosthetics program at Northwestern University in Chicago and earned his prosthetics certification in 2004. 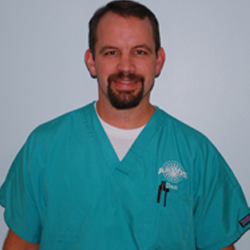 Dan received his orthotic certification in 2009. Dan continues to keep his LPTA license current and works, as needed, for Restore Therapy. Dan has a son Drew. He is actively involved at Boone’s Chapel Baptist Church and CAST Ministries. In his free time, Dan enjoys spending time in the outdoors.